Time is truly of the essence, especially when it feels like there is not enough time in the day. As some of you may know I’ve taken up a new university degree this year. Full time, online and so much to learn. I’m still working full time too and of course there is the rest of the life stuff, including somehow maintaining this blog, keeping a balance and finding time in the busy for me. So this post couldn’t have come at the better time. What is the best way to keep track of time when studying? With a watch of course. I don’t want to lose concentration by picking up my phone (because we all know I’ll be scrolling Instagram in seconds) so I’ve found wearing a watch is the ultimate time keeping tool for my busy schedule. 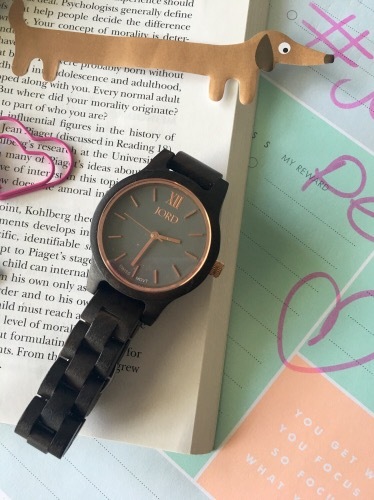 Being a bit of a fashionista though, it can’t just be any old watch – it needs to be stylish and on trend and will go with most of my OOTD’s – so that is why I’m completely obsessed with my new JORD Wood Watch. JORD couldn’t have contacted me to collab for the blog at a better time. It was fate! With so many women’s watches to choose from I had a hard time deciding on which watch would be mine. I eventually chose to review the Frankie 35 in Dark Sandalwood and Slate. It’s streamlined, slick and suits my every day style. The slate face is very on trend and super chic without being too masculine. Plus the hints of rose gold are just so pretty. I’ve found the watch extremely light weight too – it almost feels as if I’m not even wearing a watch. The best thing about JORD Wood Watches though is they’ll customise your watch to your wrist size, so if you do have large wrists like me, you’re guaranteed it’ll fit like a glove. Packaged beautifully, receiving my new time keeper was like Christmas had come early. But why should I have all the fun with my new watch? Thanks to JORD one lucky reader of The Illusive Femme blog will walk away with a new watch of their very own. It’s giveaway time! To enter the giveaway simply click the link below and enter your details – don’t worry guys, your deets will be safe. The winner of the competition will receive a $180 voucher to spend on their watch of choice. This competition isn’t just for the ladies either, JORD has an amazing range of men’s watches available too. The only thing I found was the site is full of so many unique watches, I couldn’t choose a favourite! I hope you guys do better than me. The competition will run until April 16 so get entering now. And if you don’t win the competition, the fabulous people at JORD want you to take advantage of 15% off any watch you like too. Simply enter cfjord15 at the check out to grab your discount. There is no better way to keep time than with super stylish watch, and one I can share with you guys too! Do you wear a watch? Which wood watch is your favourite? * I accumulate a bunch of PR samples and gifted product thanks to the blog, and I like to try out and test what I receive, sharing the best bits with you guys so you too can discover new brands and services. I will only share the products I have faith in and actually love as per my disclosure policy. 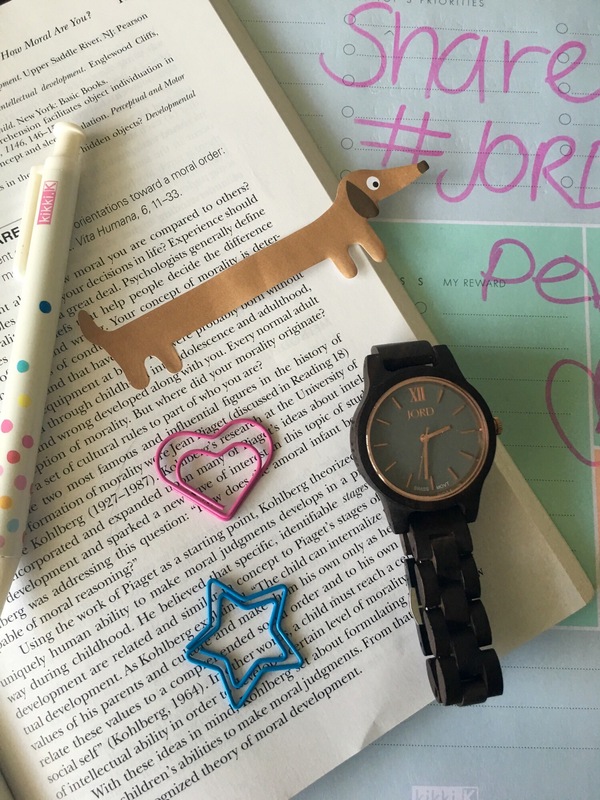 JORD watch gifted for my review – all opinions are honest and my own. It’s gorgeous hey. I’m a bit obsessed! I love the look of wooden Jord wristbands! The winner will be a lucky duck! Two? Lucky you too girl! Not going to lie, I’m entering with the hopes of landing a Cora! Do it girl. I hope you do! I never remember to wear a watch. Then I notice the batteries have all died so I just keep not wearing one. But I am always late and never on task! haha oh dear. Previous PostFive face masks to save your skin!